Thank to our group and awesome people in it, our members managed to find a problem today and a solution, in less than 1 day. Julio shared a post, with instructions on how to enable this address autocomplete on Shopify Plus stores, so people started asking about non Plus ones and if its possible. I wanted to ask my dev team tomorrow, but George Vas fixed this and made an awesome script in less then few hours. This is why this ecommunity is so great and why I love you people. Again, thank you George for making this awesome script and for sharing it with your fellow pirates. Bottle of rum for you. Also kudos to Ash Ome, for the original Shopify Plus solution and onlygrowth.com people (James Corr). Ohh, I didnt even say what is this post about. Well, you can use the might Google to autocomplete the address field on your checkout process. This really helps out with the addresses and speed of the checkout, which conveys to the checkout conversion rates. Anything that helps speed up and makes my checkout process easier for the customer is a must have in my book. And my book is the ecomm bible. You agree, right?! 5. Search for Google Places API Web Service then select it from the results list. It looks like some people cant find it like this, so they have to manually look for it. 8. Click the Dashboard on the left sidebar and you will see Google Places API Web Service appear in the list of APIs. Note: Google Places API is limited to 1,000 requests per 24 hour period. If you verify your identity with Google then you can get up to 150,000 requests for every 24 hour period. After that you need to purchase a premium plan. Details here. What to do in Shopify? Go to Online Store – Preferences – and scroll down to Analytics window, the one you used for the countdown hack. Paste the following code inside. 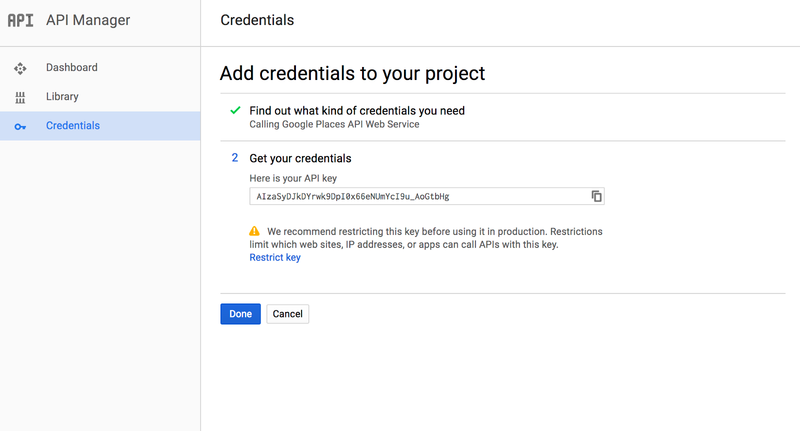 Before you do that, swap the YOUR_API_KEY with the API key you generated on the Google API dashboard in the last step above. Hey! And we got the solution for you guys with the countdown script. Use this version if you want both to work. Again, great work from Ahmed and the Ecommerce pirates FB group. Keep it up guys! Thats it. Hit the save button and you are ready to go. Should look like this fancy gif below. Enjoy the faster checkout and % higher conversion rates you get from this. Did this address autocomplete work in smartphone or website only? There are some errors on the script, maybe due to the copy/paste. Be sure to copy all the code from the code window. It works. Also be sure to follow the right API settings. OMG. It even works for the UK right out of the box. Big big thank you guys. I’ll get over to the fb group pronto! Thank you Karlo & team. This was super easy to set up and works like a charm! Working perflectly now. Thanks ! Is there any reason why I am getting the address bar locking up as soon as I try to type something? Hey – love the blog, this is such great information! Was just not able to get it to work in the address fields somehow and it says “Something went wrong” with the “i” mark above – did anyone face that issue? – Any solution to above issue will be very helpful. Did anyone face this issue before? – Can any google account be used to generate the API key and loaded into shopify account? Hey guys! Is anybody running into the problem of Shopify saying the amount of extra characters has been exceeded (limit is 8000). I’m trying to add both the countdown and auto-fill but it’s not letting me. Would love any advice! Clear the empty spaces and lines in the code. Hey Was wondering if this solution could work for any page that I place additional text boxes and I want that text box to have the google autocomplete API? **UPDATE** the way to add this to another page is to figure out what window.location.href contains for the page that you want it to be on. Then add the ID checkout_shipping_address_address1 to each of the text boxes that you want to have the google address autocomplete. Then, you must add an or || to the if statement if (window.location.href.indexOf(‘checkout’) > -1 || window.location.href.indexOf(‘THIS IS WHATEVER YOU DETERMINED IS IN THE HREF OF THE PAGE THAT YOU WANT IT TO BE ON’) > -1). This is a super simple fix to the problem and allows for any page that contains whatever you put within the indexOf(). Hope this helps anybody that ever had my same problem. And thanks to the conversion pirate as this was the only solution to adding google addres autocomplete to a shopify site without upgrading to plus!! I feel like I struck gold with stumbling upon this blog and the google autocomplete code!!! I had paid to have this installed when I was on the Yahoo Store platform and loved it then. When I switched over to Shopify about 6 weeks ago, I didn’t think the google autocomplete was possible to enable in the Shopify checkout. But lo and behold, one click here and one click there, I come across this awesome blog! Thanks for all who worked on making this valuable information possible!!!!! OMFG! The Best!!! It JUST WORKS!! SO Easy! Pirates rule! Im coming unstuck on step 5. When I search for “Google Places API Web Service” nothing is found. The only similar ones that are coming up as I type in the search box are “Google Places API for Android” and “Google Places API for iOS”. Any suggestions?? Thanks! Search manually in the library. so, I wanted to have it in a different color and it going for 15 minutes… is there a way that I can combine both? Has anyone else experienced this problem? You may want to test your checkout page. For now, I only have the countdown script since there is no conflicting issues as far as I know.